Let’s talk Creepy Halloween Food Ideas: well maybe not totally creepy. More like Halloween food puns. Many of you enjoyed my post on candy “sushi”. Don’t worry these are fish free and everything is made out of sugar…. Need I say more. When I posted this back in 2011 I found the body part candy at World Market . That gave me an idea!! 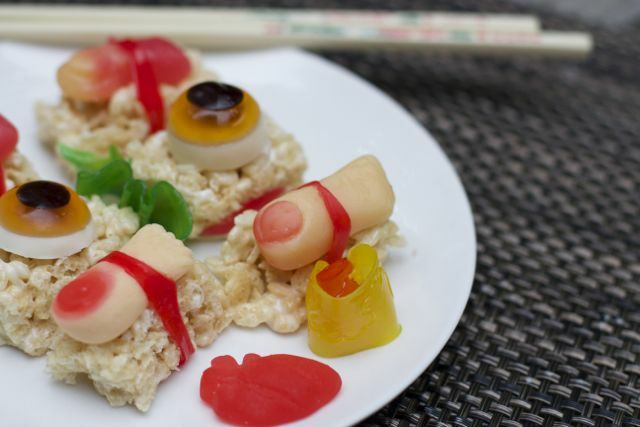 I would make Halloween Candy Sushi to trick the kids. It took a few stores to find body part gummies but I found them at the Dollar Store. 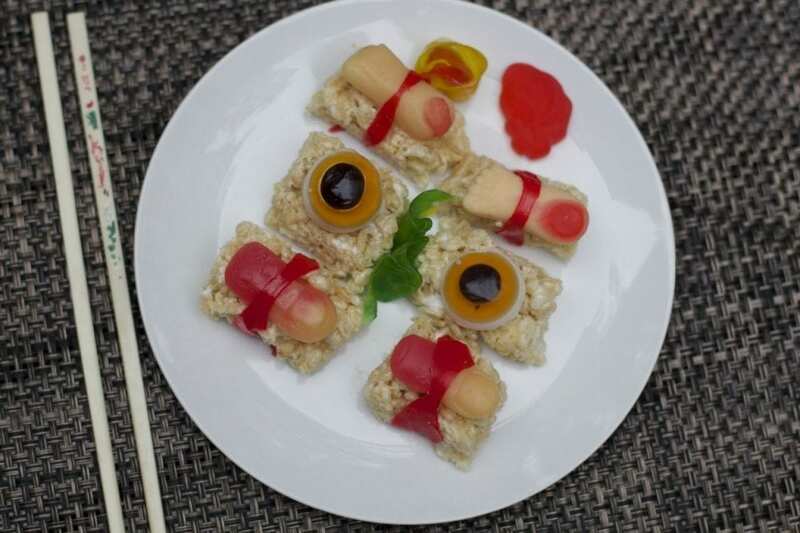 This no-bake Halloween treat takes simple steps of making Rice Krispie treats, buying gummy body parts and a few rolls of fruit by the yard. If you want to make it more gruesome, add some gummy spiders or worms. I went with gummy body parts but get as creative as you want. You can even make some rolled sushi too if you want. I added a “heart” and some rolled up fruit by the yard to resemble the wasabi and ginger you typically get at a Sushi Restaurant. How fun for you to show up to a school Halloween Party and hand out Body party Sushi. I think everyone will get a chuckle. A great peanut free snack to take to the allergy class. (just be sure to check your labels) I hope you don’t this this is spooky food? Hope you have a wonderful Halloween. 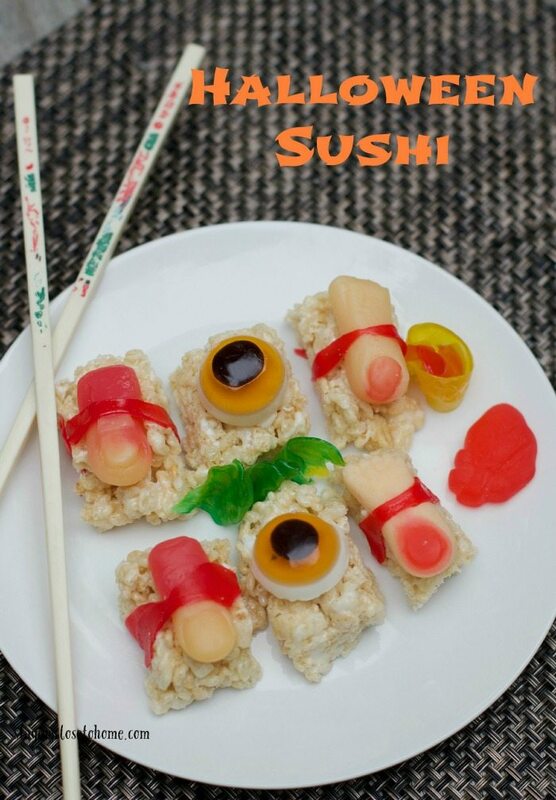 Just be sure you are eating candy sushi if you are served eye balls. 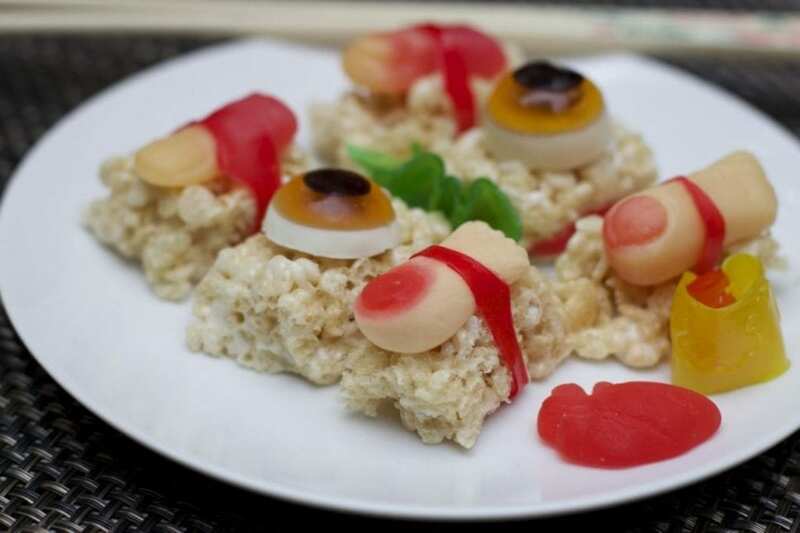 For more detailed directions on how to make candy sushi be sure to view the Sushi post. Would your kids consider this spooky food? This is the cutest, spookiest snack idea I’ve seen! I can’t wait to create it to surprise my kids! I love that it looks like sushi! We bought a bag of those body parts for Halloween too! Love this idea! And I’m so bummed I didn’t find a bag of these gummies. I’m sure we could have had a lot of fun with those. My son saw this and is totally tripping over it. He wants to try this out he finds it so cool. Haha! That is hilarious! The funny thing is my kids would gladly eat that “finger” but wouldn’t get close to sushi. I think that would make for an awesome Halloween party! This is just too cute! My oldest daughter loves sushi so I think I will make this for her tomorrow! Oh Dog! That was a GREAT idea! I oughtta take something like that in for a staff gathering sometime. New follower here via the weekend blog hop. I love it. My 3 year old son loves California rolls, but after introducing him to these treats, he may never go back. I think my husband will appreciate them just as much. They are definitely a twist compared to other halloween sweets. That is cute! I love this idea and a great little project to do with kiddos that turns out to be yummy for them. Cute!! These are super cute! Thanks for stopping by my blog, can’t wait to see more!